"You must learn to block or my speed will always overcome you!" 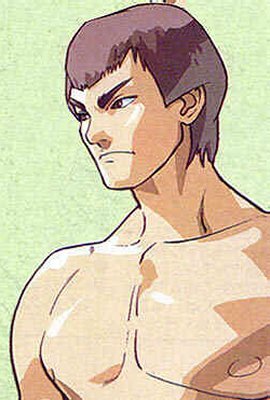 Fei Long is a skillful Jeet Kune Do master, and an avid student of Bruce Lee's teachings. He was often compared to the famous action star, because of his small yet strong frame. Like his hero, Fei Long is also an actor and has starred in many action movies in his native Hong Kong. Despite his stardom, Fei Long never forgot his roots and continued to train hard. During his off-time at film shootings, he often visited a local establishment where fighters gathered to test their skills. On one such occasion, Fei Long witnessed a newcomer named Ryu easily defeat a skilled opponent. Seeing a new challenge, Fei Long challenged Ryu and was quickly defeated. Humiliated by his defeat in front of his fans, Fei Long realized that he had much to learn. After his movie was finished, he took a break from his acting career and began to seek challenges that would improve his skill. He heard of the World Warriors tournament being hosted by M.Bison and joined as a late entry. He sought a rematch with Ryu, but was defeated in battle by Ken He returned home and declined further movie offers. His lifelong ambition had been to be an actor, but he now abandoned his career to follow the path of Kung Fu. He continued to train so that he one day could defeat Ryu. -Fei Long means "Flying Dragon" in Chinese.